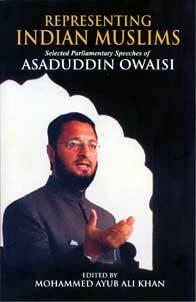 From the back cover of the book: Asaduddin Owaisi is one of the most articulate members in Lok Sabha. India Today rated him among the most articulate among the young MPs early in 2007. His legal education at London University and Lincoln’s Inn and advance preparation before delivering speeches impressed many from the treasury benches, one of them being Mani Shankar Aiyar. He once told the present writer that he teasingly said to Asaduddin Owaisi that he is in the wrong party! His talents are needed in Congress! As the only member of a small party in Lok Sabha, his turn to speak often comes late in the day when the house is full. Owaisi takes advantage of the opportunity to speak eloquently. Barrister Owaisi is often on the various TV channels participating with eloquence. A perusal of Indian newspapers in English, Telugu and Urdu reveals an MP ever present at every occasion concerning the community: meetings with police officials, state government ministers, municipal authorities and so on. As a keen observer of Indian Muslim scene for last 30 years, I hope that he will further excel by delivering speeches armed with facts and figures.